Organic sense of self-improvement fuelled by the genuine and self-motivated desire of all individuals to make things better. When coaching is placed firmly at the heart of processes for developing others, teachers and other staff members experience a process in which belief in the development of human potential becomes central to the conversation. Individuals come to see more fully their unique role and the contributions they can make towards bringing about improvements in their school. Rather than seeing it as something that is done to them, they begin to understand what it means to be accountable to themselves and others and they start to own the process. Questions have the power to change both the content and direction of a conversation. They can play a key role in shaping the structure of a meeting and the quality of outcomes. Such questions help to ensure that staff are not simply showing compliance in meetings but are committing both to the school’s bigger picture and their own values and reasons for being in the profession. There are many a time, when SLT members need to be confident in their ability to use questions to help individuals move out of their comfort zones and try something new. They must have the skill set necessary to help individuals face their fears, so that once their fears are placed out in the open, they can be supported to identify strategies for overcoming them and making progress for both themselves and their school. Senior leaders develop their ability to do this, when they are able to identify the various ways in which individuals either behave our use language to keep them stuck. Once these defence mechanisms are brought out into the open, leaders can help individuals to create new paradigms that will enable them to stretch and move beyond the confines of the familiar. Many conversations take place in school when only half of what the speaker has said has been either fully heard or understood. Why? Because we have become so used to giving the impression of listening that we have forgotten what it means to truly listen and to really hear what has been said. Increasingly, our minds are so distracted by the many things that fight for our attention, even sometimes in a one-to-one situation, we do not realise that this can be a time to close the door, re-direct our phone calls and pay full attention to the person in front of us. Only when we truly master the art of listening can we hear and learn to understand what is being conveyed in the words, gestures, body language – and the ‘silences’ – of others. When we can read non-verbal communication and understand the emotion behind a word or a sentence, or the message conveyed in a look to the side or a folded arm, we are able to enter into conversations with another that have far greater potential for development and growth. Probably one of the biggest challenges SLT members face is in managing the range of emotions that can arise when dealing with underperforming staff. Underperforming staff can often be angry, defensive, withdrawn and uncooperative. We probably all have a degree of expertise in dealing with these behaviours in our pupils, but when it comes to managing these behaviours in other adults, it is seriously hard work. Line managers themselves tend to adopt a range of coping strategies, e.g. avoidance, only giving positive, upbeat messages, or finding someone more senior to hold the other person to account. None of these approaches are satisfactory, as they neither serve to move the development of the line manager or staff member forward. Both are weakened through an inability to face challenging emotions head on. 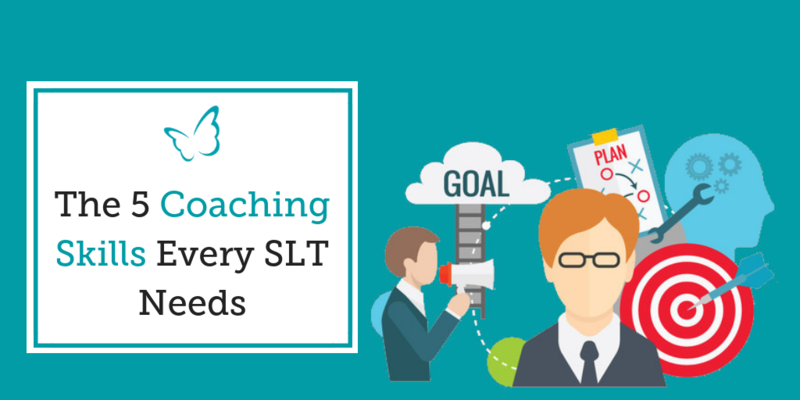 SLT staff grow, when through coaching, they develop the skills to ‘hold’ uncomfortable emotions and still have the conversation that will move both themselves and the other forward. This really is about your own level of emotional intelligence. How well tuned in you are to yourself. Do you give yourself enough time to stop and listen to your own emotions and the impact they may be having on yourself and others? Emotions are contagious and in 1:1 situations, even more so. This is because your feelings always impact on your thoughts and your thoughts always impact on your behaviours. If you are feeling negative about a person, it is more likely that the outcome of your meeting with them will also be negative. The individual will pick up on your negative energy and reflect it back at you. Both of you receive signals from each other that you are in an unsafe environment. As a result, the ensuing dialogue is one that takes place behind emotional and psychological defences, each party seeking to protect their own sense of being and self- worth. It’s not always easy an SLT member to remain emotionally grounded, particularly school relationships, take up so much of your own emotional resources. However, very often your levels of effectiveness are determined by your own ability to remain centred when others around you are not. Coaching enables you to do just this. It is a process through which physiologically, as you learn to be still in the presence of another, your responses to stress and the heightened emotions of others change. A change ‘in being’ that you are then able to carry over to other aspects of your life as a school leader and show greater calmness amongst the daily stresses of school life. There is all kinds of advice out there about what makes a good school leader, from certifications to strategies to taking the latest seminar. But what so many people miss out on is actually the most fundamental elements of good school leadership — relationships. In my years of working with school leaders, I’ve learned that one of the most important skills any school leader can have is the ability to effectively manage and nurture personalities and relationships within their school – as quite simply, when school relationships are positive – the outcomes are often more likely to be positive too. Conversely, when relationships are strained or neglected, school teams can struggle to effectively work together and staff can find themselves increasingly becoming disconnected from what the school and their leaders are trying to achieve. In turn, leaders can find themselves spending a large amount of their time dealing with people management issues, rather than focussing on the more strategic aspects of the role. Yet in spite of this, many leaders have not received significant training or opportunities to develop skills that could help them to deal with difficult conversations, identify how best to manage and maximise the performance. That’s why one of the key ways that we support School Leaders fulfil their vision is by offering a 4 Day Coaching Programme designed to provide senior school leaders with the knowledge, skills and confidence to apply a range of coaching skills that can help improve the performance of those they lead and manage.